Protesters picket the last summer barbecue hosted by MP Erin Weir. Photo courtesy of Chelsea Flook. Ever since I was young enough to understand politics, I’ve said that I bleed orange. My parents have lived and breathed the SaskNDP since before I was born – they fell in love after they met at a Saskatchewan NDP convention. My childhood home was a reflection of their politics: Mouseland was told as a bedtime story, orange NDP signs adorned the lawn, and photos of Tommy Douglas hung on every wall (I thought he was my grandfather until I was seven). I used to revel in the stories they would tell about their campaigns beating Conservative MLAs, and my father’s weekly lessons in how to canvass properly. As soon as I moved to Regina, my mother walked me into the SaskNDP office to get me a SaskNDP membership and she was greeted by first name, as if she hadn’t lived out of the province for the past 20 years. At the time, it made sense; my parents always spoke about the SaskNDP as if it was their family. But a few years later, returning to Saskatchewan after working out-of-province for three years, I was startled to find that friends of mine – the children of SaskNDP loyalists, like me – had been leaving the party in droves. I was confused, until the stories about Adam Duke and Erin Weir began to surface. These were men who took advantage of women, all within left-wing, “progressive” spaces that allowed women to feel like they could let their guard down. The SaskNDP didn’t feel like a family anymore – or maybe it hadn’t been a family for a long time. I was confused, until the stories about Adam Duke and Erin Weir began to surface. Some have pointed out that he (finally) met with a social coach to “understand and work through the concerns flagged by the investigator.” This coaching session is not the community accountability that we call for during the protests and rallies against his candidacy. 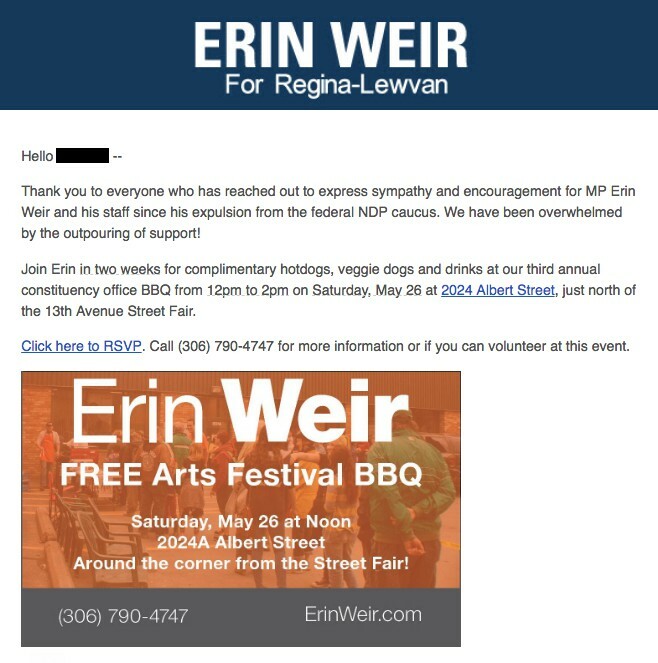 Instead, the coaching session seems like politicking, based on the fact that Weir supplied the report from the coach to a news outlet while in the same breath saying he wants to be allowed to run for the NDP in 2019. Instead, he called the claims “trumped up,” and outed one of the complainants. Then, last week, 68 former SaskNDP MLAs and MPs signed a letter calling his ousting unfair. People I look up to, and most of all, people who I love, signed that letter. It was heartbreaking to see people who have supported and encouraged me to get involved in politics prioritize a man’s reputation over the very real women who have felt the effects of Erin’s harassment. The people who signed that letter aren’t just defending Erin – they’ve given the green light for members of our party to continue disparaging the complainants and other survivors of harassment within the party. Since Erin’s ejection from the caucus, hundreds of young NDPers have found themselves doing just this; challenging the status quo of abuses of power in the party. We’ve all had interactions with long-term party loyalists about the state of our party, often using the Weir situation as a jumping off point. 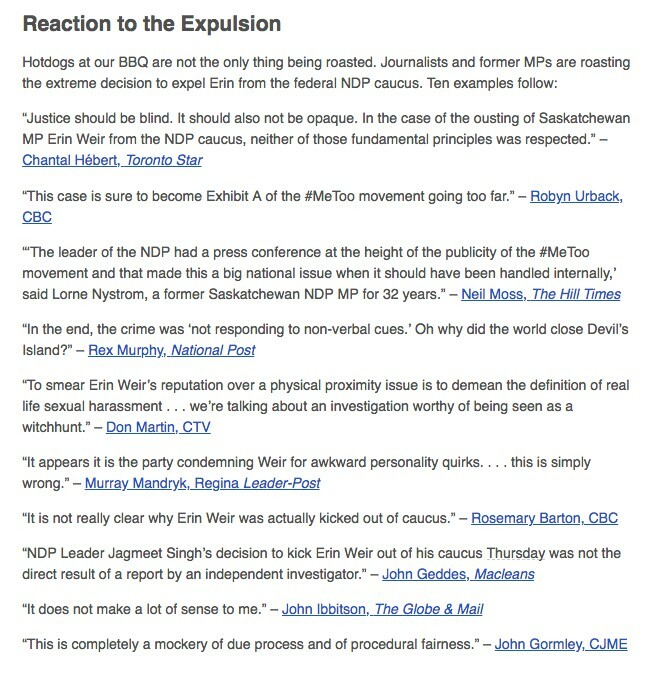 Earlier this week, protesters – mostly young women – interrupted a Weir BBQ with pamphlets explaining their concerns, only to be faced with members of our party accusing them of being “disgraces to the NDP.” At a similar picket in May friends of mine experienced Weir staffers inferring that they were “SaskParty plants.” My friends and I have been regularly screamed at and physically intimidated by SaskNDP long-timers who see our protests as nothing more than a childish tantrum wrapped in a political grudge. Young NDP organizers who criticized Weir on Facebook in the past week are met with irate comments. As we engage in discussions on Facebook and Twitter about the state of our party, we’re faced with misogynistic slurs and invitations to commit suicide by fellow party members. Is this the SaskNDP we want? Where young women are bullied into silence, and survivors of harassment and violence are shamed into isolation? To those who oppose us, young NDP organizers, I say: How dare you discourage young people from demanding a better party? How dare you discourage young people from holding oppressive people accountable for their actions? It’s obvious to me that those who doubt the stories of women and survivors of harassment in the NDP have never sincerely asked or listened to young women. It’s indisputable that there are powerful men within the party who hurt women and step on the necks of marginalized people in order to get ahead. I see this every day when I am belittled for speaking up for women’s rights by the same NDP loyalists who accuse the SaskParty of being misogynists. Let us remember who keeps this party going; it is creative, feminist, radical, militant young people. The same young people who are now being shoved out and insulted by long-standing SaskNDP elites for daring to challenge a system that no longer supports us. How dare you discourage young people from demanding a better party? Jack Layton’s parting words: “Love is better than anger. Hope is better than fear. Optimism is better than despair.” But I am angry at my party for turning their backs on victims of violence. I am fearful of a party who would rather protect a man who quotes John Gormley in reference to sexual violence than the young women who could lead their party to victory during the next election. And I am desperate for a party that supports the young future leaders who dare challenge the status quo that exists within our orange walls. We are young people clamouring for a party that supports survivors, values consent, uplifts marginalized voices, and unapologetically shouts down abusive men. We will not be the downfall of the Saskatchewan NDP, as so many of the loyalists claim. If this party collapses, it will be because of the actions of change-fearing party members who protect men like Erin Weir and Adam Duke. And I promise you this: we – who are standing up against the status quo, harassment, and violence – will re-build this party on those ruins. We will remember this story. The story of what happens when oppressive party brass protects people who abuse our political family. The story of a left-wing provincial party falling behind its federal peer, and what happens when you abandon the same young, innovative people who brought you success to begin with. An earlier version of this article stated that Weir did not apologize, when, in fact, he did. It also stated that the letter from 67 former Saskatchewan NDP MPs and MLAs was signed last week, when, in fact, it was written and sent in May, and updated with additional names and reported on in the press last week. At the time of publication, there were 67 signatories, but presently there are 68 signatories.